Sierra Madre readers may recall the controversial postcard John Harabedian sent out during his campaign in 2012 picturing himself with a couple of semi-uniformed Sierra Madre cops, and how that led to a big City Hall investigation (link). The results of that inquiry were never released to we the people, of course. They almost never are. Such cop things are considered a personnel matter, and whatever punishments were leveled upon the heads of the officers involved remain a big secret. Under the law they have rights that you and I do not have. Must be nice. But action was taken, and we haven't seen any political material with Sierra Madre cop pictures included ever since. Today we are living in the year 2018, and apparently such lessons have yet to be learned in the City of Arcadia. We are now bearing witness to something the clearly out of touch Bulldozer Bob Harbicht proudly plastered all over his Facebook page. It is definitely a legal no-no, and I suspect all involved will be called out on it quite soon. As they should be. Somebody has to keep an eye on these characters. Posted on Bob’s Facebook page is a stunning example of what not to do during a campaign. Note the smiling faces of all those involved. While it is good to be confident, officers also need to understand the laws. Isn't that why they are being paid so much? Someone must have been on duty and thought all he would need to do is just change his shirt and everything would be good to go. 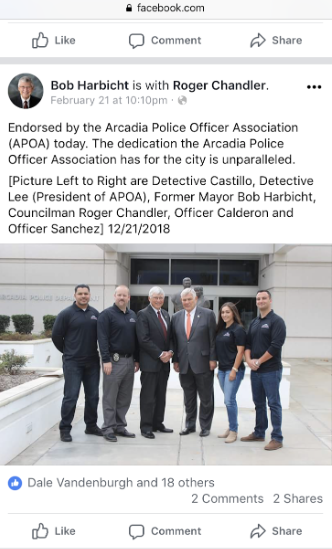 Pictured second from the left is Detective Ken "Schoolboy" Lee, newly elected president of the Arcadia Police Officer’s Association. In this photo, posted proudly on Harbicht’s Facebook page as an emblem of honor, is the police badge of Ken Lee. It symbolizes the legal authority vested upon him by the City of Arcadia. Who wouldn’t follow the command of an armed police detective when confronted by this badge of authority? God help you if you don't. 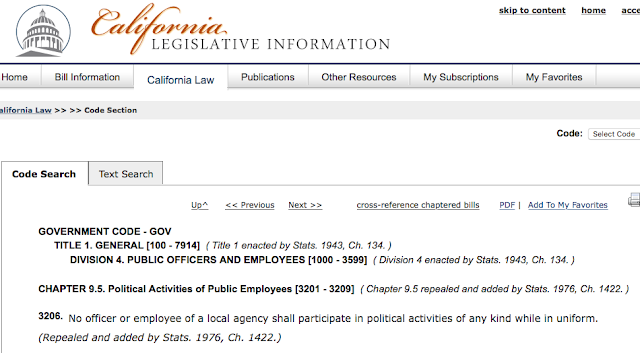 Here is what our State of California says about an officer wearing uniform identifiers such as his cop badge while posing in a political photo like the one above (link). It probably doesn't help the cause of the officers pictured above that they are also standing right there in front of the Arcadia Police Department building, either. This too is a definite legal wrong (link). I think all of the folks in Harbicht's Facebook picture need to take that (b) part very seriously. I'm pretty certain that the taxpayers of Arcadia didn't pay for that building so it could be used as a gratuitous campaign prop for the likes of Bulldozer Bob and Cheap Trick Chandler. There is also this Federal law known as the Hatch Act. It too frowns upon the kinds of shenanigans we are discussing today. The Fraternal Order of Police has put together an excellent review of the Hatch Act, which you can check out here. But for those of us who like to get straight to the point, here's some of the special spice. "Use any official authority for influence for political purposes, including using the officer’s official title or authority to coerce individuals to participate in political activity." I think that when poor old Bob Harbicht identified the posing officers in this Facebook political picture by their official titles, he immediately condemned them to long hours of sitting with the City Attorney and being asked if they need to have their fool heads examined. You know who enforces the Hatch Act, right? That would be the FBI. An agency that certainly knows its way around Arcadia. Especially after all of that Gem Coins stuff a couple years back. 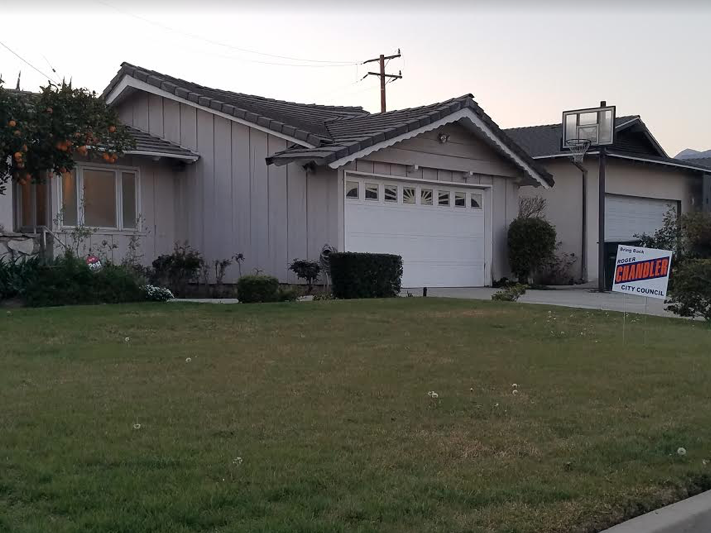 Look at who has given his lawn sign endorsement to Roger Chandler. None other than disgraced former Arcadia Mayor John Wuo himself! I have got to get real with you for a second, Arcadia. Aren't you sick to death of these shady pols yet? Isn't it time to fire Bulldozer and Cheap Trick, once and for all? Maybe Arcadia PD has sights on patrolling Sierra Madre in the future? What's with the date of the photo 12/21/18? Did Bulldozer travel to the future to take this? Bob is looking forward to the Christmas holidays. Funny how no one mentions that April Verlato posed for a "candid" photo in front of the police station during her 2014 campaign. I guess tax payers only get offended when its Harbicht or Chandler? How many police were in the photo? How sweet. 2:08 made a whattabout. No police officers were with her. I suppose they had too much self respect to be seen with her. Not at all, I'm the child of one, husband to one and father to another. I just don't like shifty politicians or hypocritical reporting. If its not ok for one politician to pose in front of the building, it shouldn't be for anyone. The truth is anyone can pose in front of a public building. It is fine for a politician to stand in front of a building. What isn't OK is for a sworn officer wearing his badge to give a political endorsement to a politician that is standing next to him, who then places a picture of this on a political site. The fact that Harbicht has now removed the offending parts from his Facebook page because the City Clerk demanded it is proof enough of wrongdoing. Are you really this clueless? It was clearly a mistake. The officer involved forgot to cover his badge and now the Tattler squad is running around trying to make something of it. If it were done with purpose, wouldn't they have been in their full uniform. Wouldn't they have all had their badges on? Please try to think! I know its not the norm here but give it a try. If Beck was in that picture you'd be losing your mind. 3:48. Let me get this straight: you’re telling people here that they need to think. But, you also said “the officer forgot to cover his badge”. So you mean he should have HID his badge and there would have been no issue? What a moron, clearly you’re a Bulldozer-mentality human (I.e. clueless). Harbicht supporters are a few whiskers short of a Hello Kitty party. 4:53, are you following what's being talked about at all? The whining is about his badge showing. So yes, if the badge was covered you chickens would have nothing to cluck about. You 4:53 are the moron. According to Transparent California, this is what Detective Lee makes. Apparently he doesn't think it is enough. With so many years under his belt on City Council, you'd think that Harbicht would know better. Harbicht just got some people in trouble. Arcadia's Police Department doesn't hold ethics classes? The Arcadia Police Department stinks!!! That police force is on welfare, from my tax dollars. They do absolutely NOTHING to actually EARN their exorbitant incomes. They falsely LABEL VICTIMS, act like total JERKS, make stupid jokes, are sarcastic, and quite IGNORANT. They are not about PREVENTION at all, but then, no police force is. If you see something, say something?!!! Really?!!! They do not have the necessary training to be cops in the first place. I doubt they are even screened for psychiatric "impediments". They do not have a clue about anything, or are told to act stupid. They could not solve a crime if their lives depended on it, nor do they want to. Their detectives are quite the joke of Arcadia, and criminals are laughing their f$$$$$g heads off. Anything goes in this corrupt city, but that is the norm, not the exception. Show me a decent police force, and I would be truly amazed, and they wonder why they are so hated? They help criminals because they must be criminals themselves. Forty percent of so-called "law enforcement" abuse their spouses, pets, and children, from the statistics I have studied, and have been privy to. We are ALL on our own. That is truly scary. Being forced to take the law into our own hands, or die trying? It's maddening to think that he'll get away with breaking the law, that all sorts of people will be swayed by seeing this picture that should never have happened in the first place. And the remedy? Some kind of retraction that very few will see? Photo opp's with authoritative figures along side political candidates may have gone the way of the placement of election signage; no more rules. That would only be if the laws on police political behavior are not enforced. That is about to be put to the test. Stand by. Nine hundred and eighty days until the re-election of Donald J. Trump. President Trump has announced his 2020 run for re-election. Former Digital Director Brad Parscale will be his campaign manager. KAGA. Donald will be campaigning exclusively from the Leavenworth White House. The guards will welcome trump knowing that if they’re ever attacked, he’ill run to their aid. The Associated Press reported Tuesday that the campaign manager of President Donald Trump’s 2020 reelection campaign has close financial ties to a penny-stock firm with a top executive who was caught in an FBI bribery sting and pleaded guilty to securities fraud. Yesterday, one of the first responders to the Florida high school mass murders was being interviewed on his decision to take a critically wounded student to the best treament center for her level of care. He deternined that she was 18 and could go to adult trauma care that was closer than a hospital with pediatric trauma care. It saved her life. He was asked further about some of his feelings about what he witnessed at the hands of a gunman with an military-grade weapon: He deferred. "I am in uniform." The Arcadia FD has announced they will not be endorsing any candidates. My guess is Harbicht is running too dirty a campaign for them and they have decided to keep their distance. Good point. Both I guess. 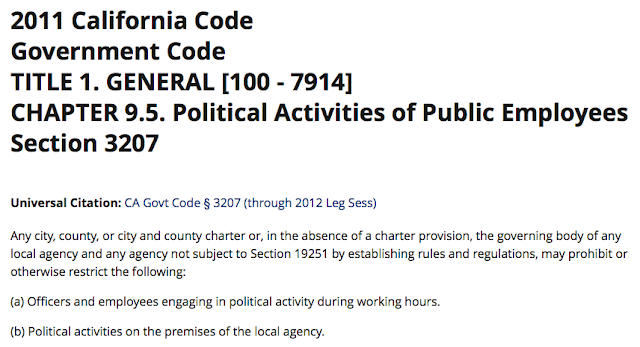 It's because AFD's union is playing it safe instead of standing up for what's best for Arcadia. No surprise here, they want to look like good guys while the rest of the city does the dirty work. I think the Fire Department is offended by the gutter campaign being run by Sho Tay and Bob Harbicht. Good on them! No, its because AFD association are political cowards. They want to keep their cushy work schedule and pretend to be the good guys. Not supporting that old nut Harbicht makes the Fire Department cowards? Have you said that to their faces yet? The letter from the AFD stated all the candidates are concerned for safety, so the AFD had no reason to pick just one. That's about the fairest statement so far in this city council race. Too bad Harbicht and Chandler are so nasty and untruthful. They should be ashamed. AFD's association is trying to walk down the middle of the road and not oppose or support anything. That is cowerdice! They are afraid to challenge Beck, and too weak to support the candidates that have supported them. 10:25am. Good for that responder. Sadly, as we all know; no good deed goes unpunished. I would bet that this responder will be repramended on not following protacal. The family may also take offense that a clinic not a hospital was used, especially if she was not of consenting age. It is the era of lawsuits. Reading for comprehension. What a good idea. The trauma center was at a hospital. You did not read in Mata Hari’s post any mention of Clinic. Nor did you manage to read that his decision saved her life. Latest news. The City told Harbicht to airbrush the cop badge. If you go to Bulldozer's Facebook page it is now replaced with a picture of a thumbs up. So now we know how Harbicht deals with crime. He covers it up. Covering the badge up on Bob's Facebook page might be good enough for the City Clerk, but the FPPC won't be quite as easy to placate. Bob does get special treatment at City Hall. Bulldozer Orwell also airbrushed out the words Arcadia Police from the side of that building. That is two violations the city told the idiot to fix. It is not against any law to pose in front of a public building. Anyone can do it and many have. Put away the tar and feathers you are on the wrong track. Not if you are a cop wearing your badge and in the process of giving a political endorsement. Try and keep up. Harbicht looks like he sleeps in a coffin, and only gets up when its dark. Comprehension understood. The responder stated" I am in uniform", what is it about gun control "you" do not understand 10:25am? Allowed: You did not see the TV interview. The man in uniform was a first responder, an ambulance driving fireman, not a policeman. Guns not part of the uniform or the emergency medical kit. Don’t Police get lunch breaks? Wondering since you are saying they were on duty. How did you come across that information? Those cops are in the process of getting hit with two rather expensive FPPC fines. If they did have lunch they'd probably be tossing it up right about now. How does one report his actions to the FPPC ? If you cut and paste that question into Google it will bring up quite a few helpful websites. Chandler is a retired cop. You'd think HE would know better. If it was ok for the APOA to wear their badges in political ads, they all would have been wearing them. Unfortunately, it’s all FIXED since the Arcadia Chamber of Commerce and Arcadia Association of Relators will only accept WRITTEN questions that are then screened so they only pass questions they deem acceptable. We wouldn’t want to get to the topics that matter, no. Limited to first 175 atttendees. Show up people !! Unload on those clowns. Ask Bulldozer what he did with the $27k he received during the 2016 election or what Shoguns going to do with his shooting range once he becomes mayor? Maybe Shogun can tell us who wrote the anti-Beck piece on his website? Preselected written questions are for cowards. Larry Torres is singing for his supper at the council right now. He should. PUSD's financial collapse happened on his watch. I think Torres is saying, "Don't worry." It's fascinating that people on this site call people names, call out cowardice acts, post police officer salaries, and act like they're experts, yet they all do it anonymously...seems pretty hypocritical if you ask me. Then don't read it. Go someplace else. How about posting your name, 7:57? But you’re anonymous too... are you a crooked cop out for retribution? I'm surprised this site allows blatant racism. Calling Shotay Shogun shows the true colors that this site is probably visited by bitter old white property owners. Is calling Roger "Cheap Trick Chandler" racist? Bulldozer Bob? Are their certain nationalities that cannot be poked fun at? Or are you just saying this because you're an a**hole. Trump son-in-law Jared Kushner’s failure to get a top-level security clearance raises questions about how he can do his job. Even worse. He's probably spilling secrets in exchange for much needed money to prop up his failing businesses. The Trump Administration sells out America in so many ways and the Republicans do nothing but applaud it and parrot Russian troll talking points. Traitors. @9:53. I think that he was referring to Shogun as being racist because it's Japanese. Mr Tay is from Taiwan. So your cultural slur is offensive because it has racial undertones and its uneducated. Bulldozer and Cheap trick have nothing to do with race. So maybe you should look in the mirror before calling somebody else an a**hole. Shogun is a title of honor. The poster was celebrating Sho Tay's immense prowess. Shogun a hereditary commander-in-chief in feudal Japan. Because of the military power concentrated in his hands and the consequent weakness of the nominal head of state (the mikado or emperor), the shogun was generally the real ruler of the country until feudalism was abolished in 1867. Many ladies say that Sho Tay is a Shogun of love. Shogun - In the feudal Japan, the shogun title was given to the supreme military commander. The government they established was called Bakufu. And the Japanese invaded and occupied Taiwan, committing atrocities upon its people. It is not the fault of anyone here that the Japanese and Chinese hate each other. We're just trying to rid ourselves of a bought off corrupt politician. I think I'll have sushi for lunch today. Here is a good opportunity for Sho Tay's gun store. Maybe he could put a sign in the store window that says "We are not Dicks."